Obsolete. See http://www.disasterproject.com/2016/07/stage-6-redesign-of-project-using.html for Docker 1.12 and next. In this stage we can raise containers with ldap services, but data in containers don't are permanent and ldap database is loose when a container is stopped. We need persistent storage and this can be ever the same. This is a important problem because the ldap containers can be raised in any host and the data of the ldap service must be persistent across sessions. Name resolution is critical in cluster environment. In this lab design have three sources for name resolution: Weave, Consul and external. 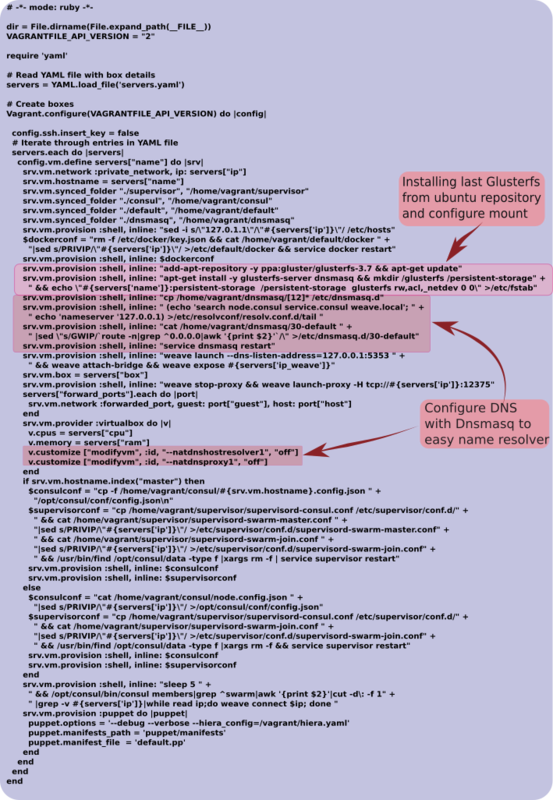 GlusterFS is a filesystem developed to support cluster environments. Is really powerful and could be deployed easily in our Lab. 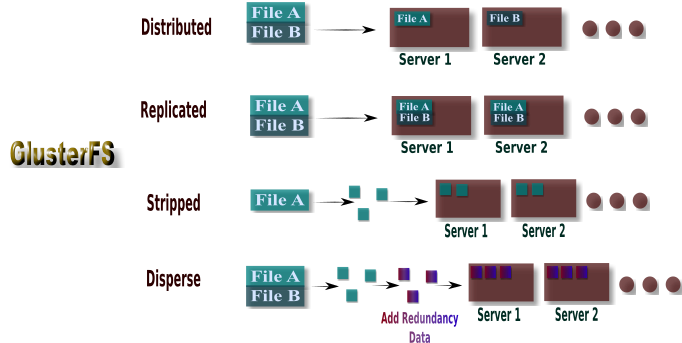 The mission of glusterfs is give us a coherent filesystem usable for each server without problems. Gluster can be defined in four modes: replication, distribution and disperse, each mode has it own features and can be mixed with the other modes (more information in glusterfs documentation). Replication: A file can be saved in n different storage peers depending in the number of replicas we need. It give us protection about storage lost. 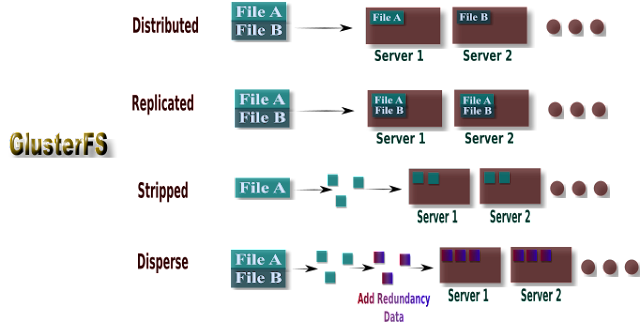 Distribution: File A and B can be saved in different storage peers. Stripped: File A can be broken in pieces and save in different storage peers. The main goal is make faster access to information. Disperse: The files are broken in pieces, add recovery information. The volumen has a redundancy value which define how many peers can be lost. We will choose a disperse configuration where we can lost two peers. This give us a folder in each server called /persistent-storage to be published in the docker containers. 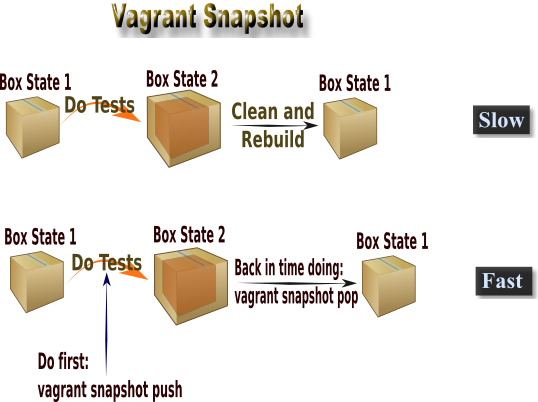 These are the steps to raise the virtual machines and the video with full execution. ~/elasticmmldap$ vagrant ssh swarm-master-1 -c "sudo gluster volume create persistent-storage disperse 3 redundancy 2 transport tcp swarm-master-1:/glusterfs swarm-master-2:/glusterfs swarm-node-1:/glusterfs swarm-node-2:/glusterfs swarm-node-3:/glusterfs force"
~/elasticmmldap$ vagrant ssh swarm-master-1 -c "sudo gluster volume start persistent-storage"